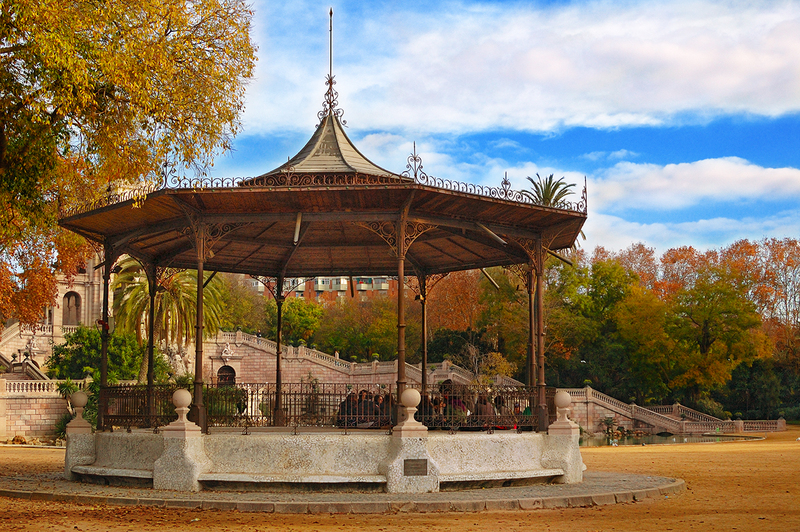 19th century romantic summer house or gazebo at Parc de la Ciutadella, Barcelona. This is one of those beautiful jewels of park architecture that still remain in the city sometimes used as meeting point by groups of students or for concerts and small performances. A magic place early in the morning to enjoy a good book or contemplate the Cascade fountain nearby. What a peaceful image. Yes, I can see myself reading that book. Just stunning, Carlos. Looks like a magic place, and I think it's wonderful that it has been kept in such great shape so that it can continue to share it's magic! Being already a quarter past three in the morning over here, you might imagine how alluring this beautiful photography is. Please have a wonderful Tuesday, filled with much time to relax. Beautiful colors of the leaves! Would be fun to share a lunch there with some friends! I love this photo ... your picture does the park justice. It's such a pretty and delicate-looking gazebo. We call these gazebos, but, unfortunately, there are not as many around as there used to be. Yours is indeed lovely! -Thanks Luis. Quiet place indeed. -Yes it is well-taken care of Jacob. -Enjoy your Tuesday too! That was a very early hour to read my post! -Thanks Luna. I would have preferred some more contrast and light but it was a hazy day. -Gracias Oscar, me alegra oir tu comentario. -Oh thanks Hilda and Kate for abounding on the linguistic part of the post. I see. No, "Gazebo" I didn't know. There's another word I read in the past going round in my mind but I couldn't figure what it was. I Googled "Summer House" and I found images showing similar stuff although I suppose this was not precisely a summerhouse cause it is more like a band shell but not a shell. Thanks for your kind help!